Avocado sandwich is one of my most favorite sandwich. It is quick and easy to make and also one of the most delicious sandwiches I have had. It is perfect for breakfast or as a snack or any time of the day! Today we will learn how to make Indian style Vegetarian Avocado Sandwich following this easy recipe with step by step pictures. Cut avocado lengthwise around the seed and open it. Discard the seed and scoop out the pulp using a spoon. Mash avocado pulp with a fork or spoon until creamy. Add finely chopped onions, green chilli and ginger garlic paste. Add tomato, capsicum, finely chopped coriander and mint leaves. Squeeze fresh lemon juice. Add salt, cumin powder, pepper powder and mix well. Our avocado spread for the sandwich is ready. Take 4 bread slices. 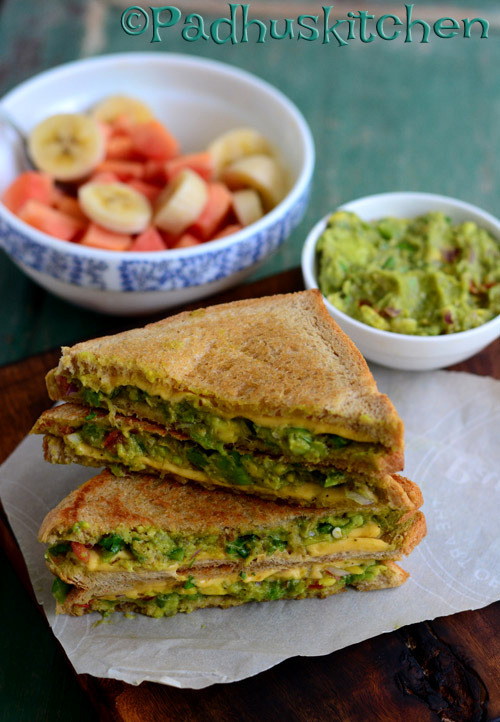 Spread avocado mixture lavishly on top of 2 bread slices. Place a cheese slice on the other 2 bread slices. Cover the avocado spread bread with the other bread (with the cheese slice) with the cheese side facing down. Heat butter/olive oil in a pan/tawa and toast both sides of the bread until golden brown. If you have a bread toaster, you can toast it in that also. Repeat the same procedure to make more avocado sandwiches. Creamy, delicious avocado sandwich is ready to be devoured. It can be enjoyed as such. Avocado and eggs make a great combo, if you eat eggs check out my Guacamole Egg Salad Sandwich. If you love avocados like me, check out more Avocado Recipes. Tips - If you have overripe avocado, do not discard it. You can puree it until creamy and apply it on your face and leave it for 20 minutes to get soft, supple and glowing skin. How to get a ripe avacado? To find out if an avocado is ripe, press it with your finger, it it gives in slightly and leaves a dent, it is ripe. If it is hard, it is not ripe. If it is too soft and mushy, it is overripe. hi padhu does this avocado sandwich taste good without toasting? It will taste awesome with or without toasting. If you like avocado, you will love it. It tastes really good....thanks for the recipe padhu. Will it stay good for a few hours e.g. for lunch packed for a picinic? Will it become soggy? I think it will stay good for 3-4 hours. I generally hate avocado... but with this receipe i can eat it everyday... thanks to u..